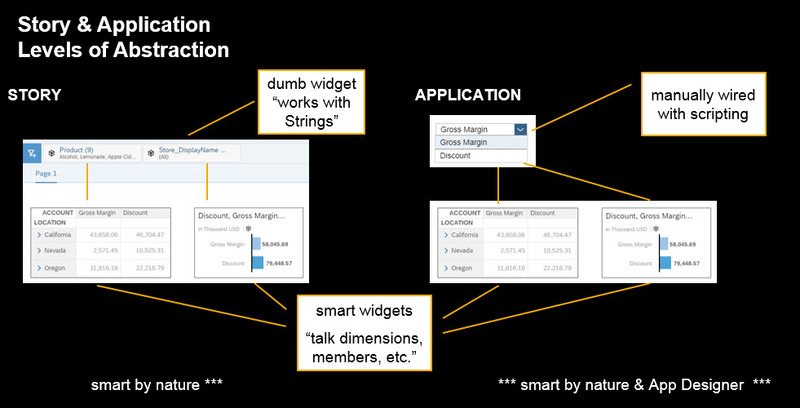 This was an ASUG webcast presented by Jie Deng today. You can watch a replay here. The usual legal disclaimer applies that anything in the future is subject to change. 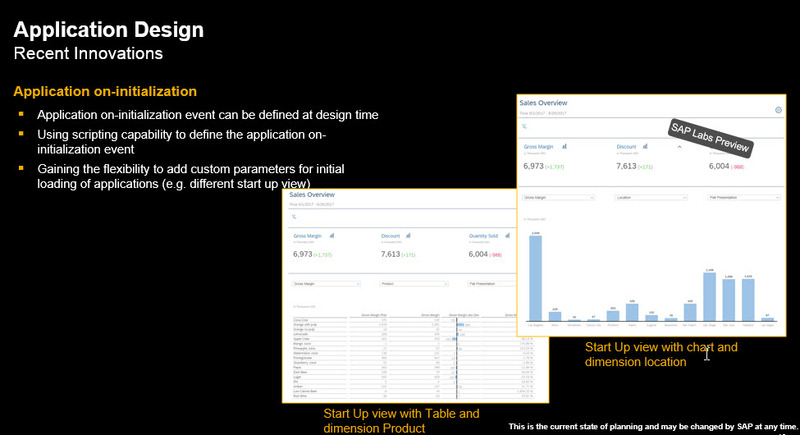 You might be a SAP Analytics Cloud user, create stories, why do you need an application? Q: Hi when it comes to features and enhancements will Lumira Designer road map play second fiddle to cloud development as has been the case with lumira discovery? 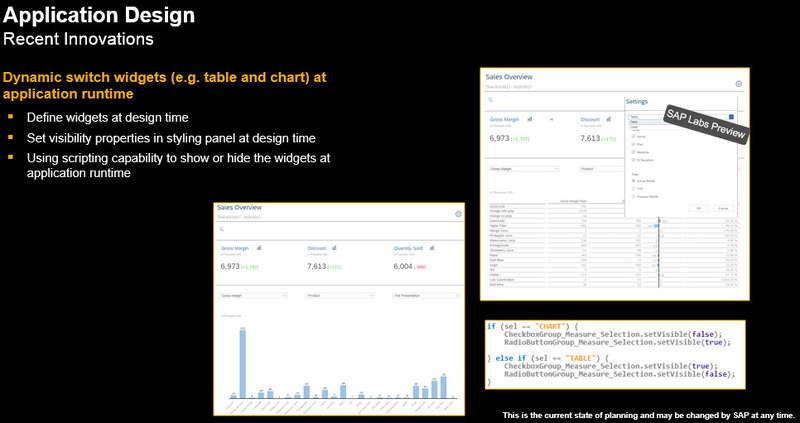 Q: Does SAC also use BIAL scripting like SAP Lumira Designer? 1. 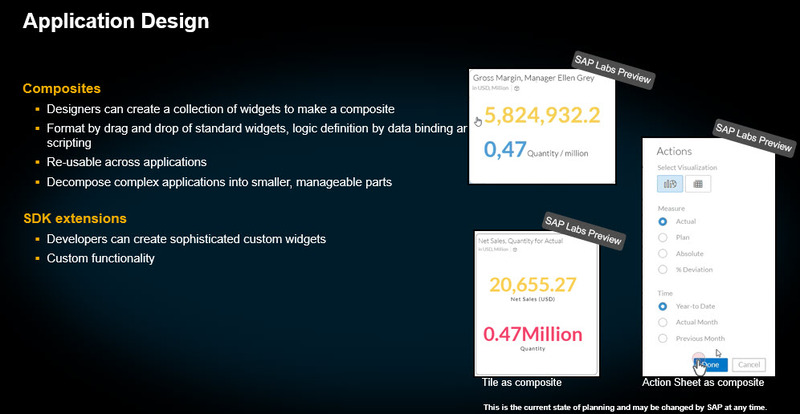 What is the difference between ‘Widgets’ in SAC versus ‘Components’ in SAP Lumira Designer? They are indeed the same. 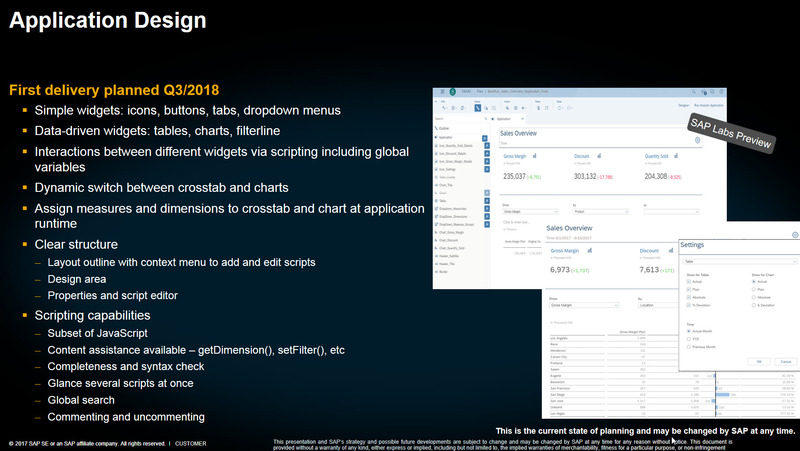 The terminology for SAC is Widgets, and in Lumira designer it calls “components”. 2. Is there a separate rich client planned for SAC Application Design? No, that’s not planned. We want to exactly leverage the advantage of SAC to use browser to directly create analytical applications instead of installing the client first. 3. Can simple widgets like dropdown menus also be data driven in SAC? What do you mean with data-driven for dropdown box? Do you mean the data-binding capability for drop-down box? If yes, the data-binding capability like we have for Design Studio is planned for future releases. 4. Are there planned abilities to cross-link or drilldown from one SAC Application to another? Is passing parameters while doing so a planned feature? Yes, this feature is planned. We are planning to deliver the navigation between different applications and also passing parameters. 5. Are the applications designed on SAC inherently responsive? Or is there a container that allows designers to make the application responsive? Currently with the first version of application design (wave13) the application is not responsive like the story. We do plan to deliver features like dynamic layout in Q4 this year. 6. Will the application design be included into the existing licensesor will there be spcal type of license to buil applications? 7. Is there a way to profile applications built to identify the bottlenecks, if any? 8. Does it share the inablities or limitations of SAC Analytics cloud. ?? 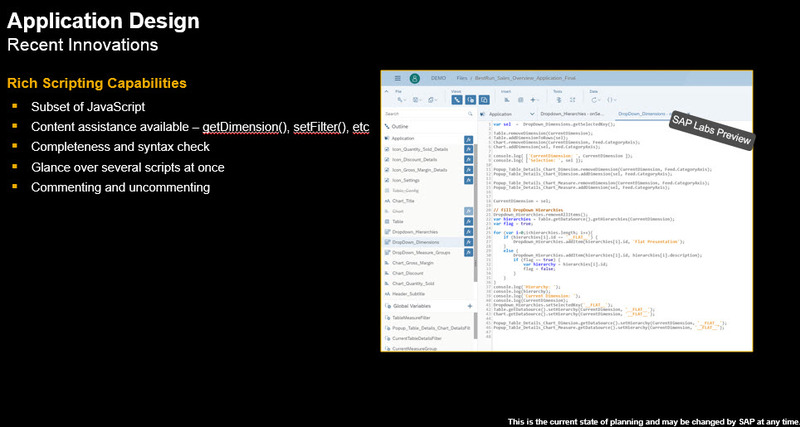 R visualization for HANA Live models, blending between different models like HANA LIve and static files? 2. Is it user responsive for mobile phones???? Application Design is integrated into the whole SAC landscape, it reuses the data modeling, data connectivity, lifecycle management etc. So it also shares the limitation of data connectivity in SAC. 9. Will this scripting capability / application design capability also apply to SAC Planning? Can SAC applications also enable user to save Planning data? Application Design is going to integrate the planning functionality that are available in SAC. So what’s possible with the planning sheet, it can be integrated into application design. Integrating Planning functionalities are planned for Q3/Q4 this year. 10. Can ‘Filter line’ component work like a cascading filter? Ex: Based on Region filter, Country is filtered. In case this cascading behavior is already modeled in the backend (e.g. 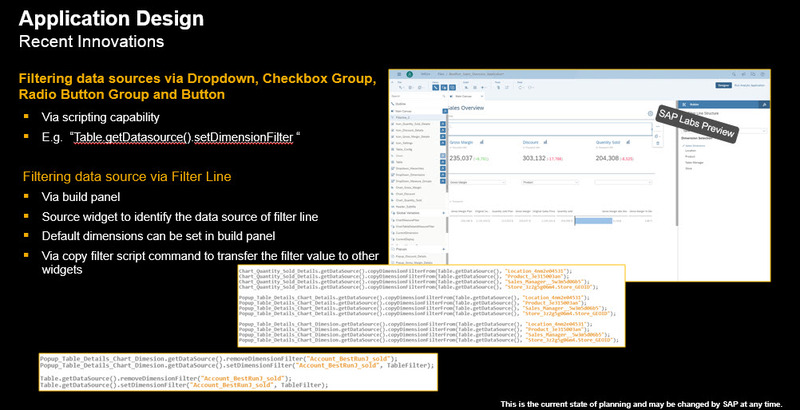 in BW, region is the attribute for country), then you will see the behavior also in filter line. 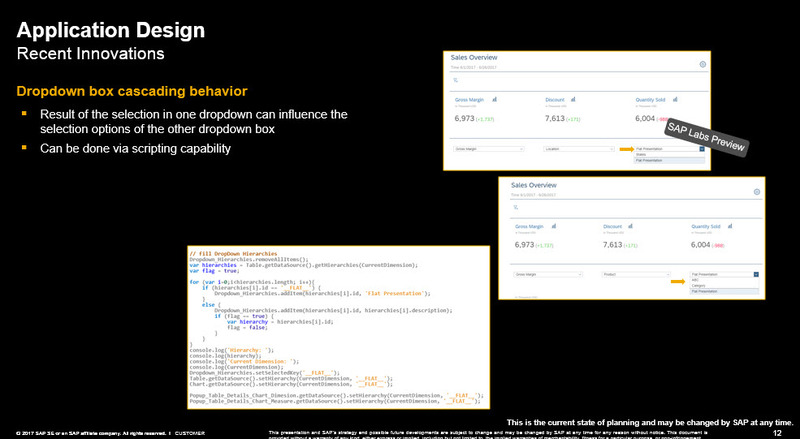 Otherwise you can use scripting capability to implement the cascading behavior and then use widget (e.g. like dropdown box) to represent it. No. They are different artifacts in SAC and serve for different purpose. For self-service scenario, business user should create stories. 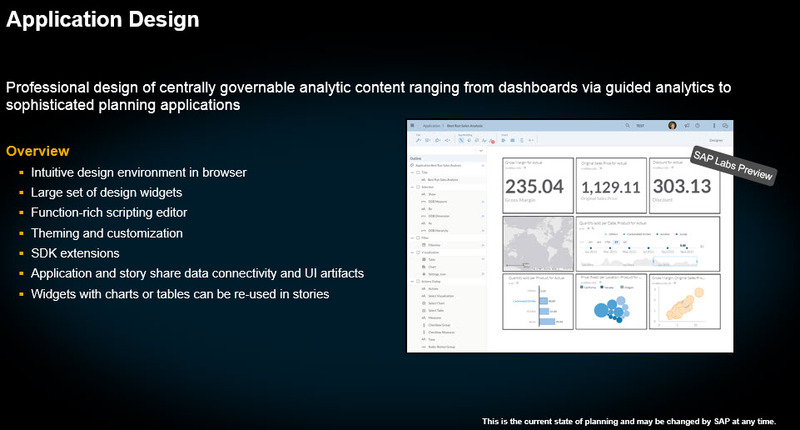 For IT-professional authored dashboards (including planning function, complex logic, and re-use aspects), then analytical applications can be created by developers/designers. 12. Also i see you have two Dates?? Currently SAC support one Date in a model!!! is it offered multiple in SAC Applications??? App Design is using the same data model as story. In my demo I have shown that you can make different date selection on data sources. 13. Currently we have a limitation in SAC till now. creating a calculated with dimension 2 3 forces the existence of dimension 2 and dimension 3 if not dimension23 dosent work! if it works it shows wierd chart and is that still persistent in SAC Application? visualization for tenant A and deployed.Now i want to reuse it for my client 2 by transporting existing hana models to client 2 teant from client 1 without data.? and can i replicate SAC Stories to use them too on the same SAC dev environment or is the Analytics hub help me to manage my stories for different tenants on deployment for each tenant? The scenario description is not 100% clear to me. Basically you can import the stories/applications etc. into SAC without Data. 15. for end of July App design applications can we use them on mobile?. With the first version of application design (wave 13), its not possible to show applications on the SAC Mobile app. 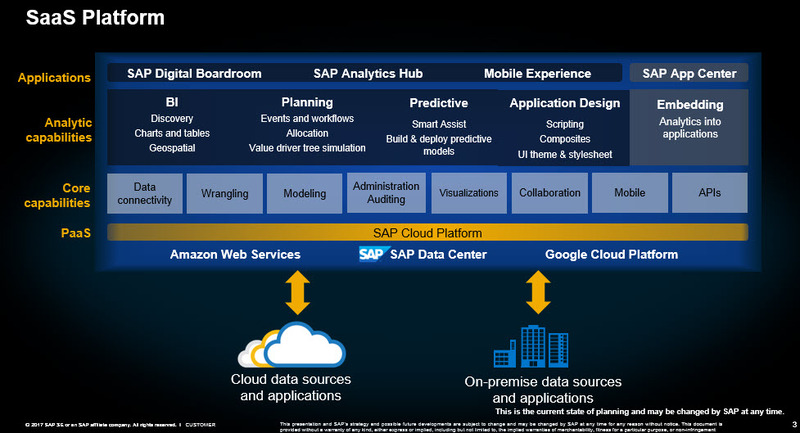 It’s on the roadmap to show analytical applications within SAC Mobile app. We had several open questions and as soon as they are answered I will update here. Hi Tammy, first of all thanks for the webinar. There are interesting times coming up. Can you give a hint, when the other questions from Q&A will be answered. I spoke with Jie last week and she said she would work on answering them; there were about 18 open questions, which is a lot, so it may take some time. Do we have a release date to look forward to these features being available? 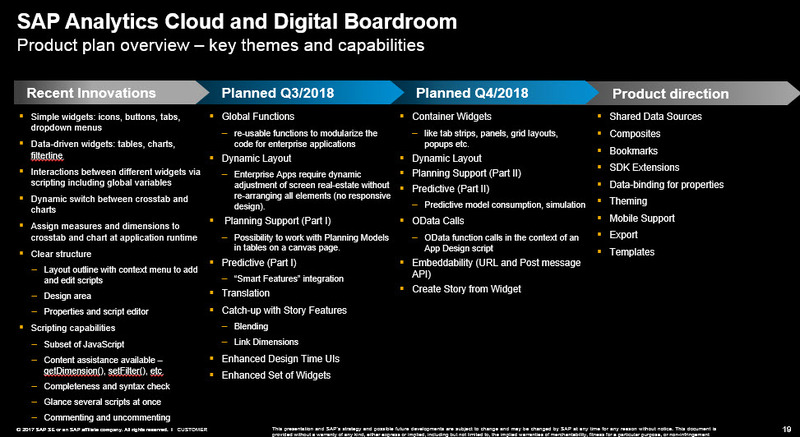 Todd – this SAP Note says CW 34 https://launchpad.support.sap.com/#/notes/2465894 – a few weeks – always subject to change. Thanks a lot for this blog, I have a question regarding to SAC. What is the difference between SAC and DesignStudio/LumiraDesigner? Is SAC Flexible like Design studio / Lumira Designer? But from the functionality they are more or less the same? or since SAC i cloud base it has some limitation in designing?